Up to Flag at 6am this morning to beat the heat and wrap up a project that has been plaguing me awhile. On the ignominiously yet appropriately named Rear-End Rock, is a low start to the old non-descriptly named Left Bulge. You start on two fairly bad underclings, slap right to an OK but weird edge (optional match)and lock off to an intermediate and then a good edge over the lip. The hard first move I got fairly early on but the reach to the lip became really frustrating as I fell there at least 6 or 7 times. I topped out this morning after two very close attempts, four sessions overall--soooo tempted to grade it V10... I'm christening it "Tongue in Cheek", proposed V9, though it's not an FA that version should have a different name. I may have to move on to Boulder Canyon since Flag is vulnerable to early morning sun. 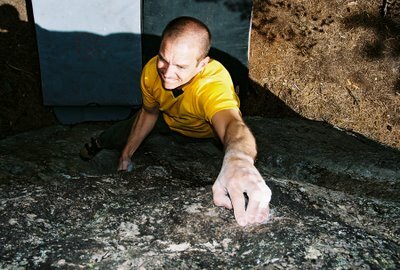 I have been chasing down feasible V8-V10 problems trying to break into the top 10 NA 35+ (essentially masters)ranking at 8a.nu. I know it sounds pathetic but the motivation 8a.nu provides is very helpful. For those of us without unlimited free time to hang out at boulders everyday, every opportunity has to be maximized and part of that is staying psyched. It also motivates me more to climb outside since you really can't enter gym problems. There are some peculiar entries in the top 20 such as a climber who has multiple flashes of the same problem and the sixth wife of Henry VIII who was born in 1512 but by and large you get a clearer picture of what people in your general age bracket are up to. Props to EZ for leading the pack locally at #6 world master category. "Chad wandered off far into the forest and beckoned some one fetch him; things were not OK. With Chad's failure to act as conduit to higher powers, we noted a sensation. We marked this time in space and thus agreed on an ensemble to step it up a notch, releasing lots of frustrated and energy and in turn feeling safe and refurbished. Without some local connection, we were f**ked, and we could see this fact in each other’s eyes." "Through our many shared sessions of ramblings and rantings, we became more confused about life in general, and less confused about the Island its incredible properties. We reached no real conclusion about what was happening in a real or littoral sense, but we were most certainly stuck on the Island, and we rejoiced." I also admired,"Why change my zones of timing?" and "Vowing to step it up a notch, again, and to stay calm around the crazy unfriendly viscous local folk..." and "This was the hand I was dealt, and I would play it." referring to his finger injury. And so on. 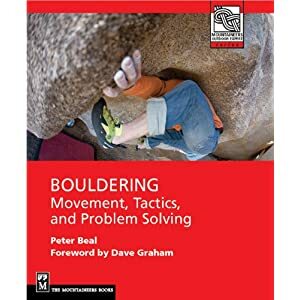 The gist of the matter is that Dave a. hardly wrote about climbing and b. did it quite well making it some of the most interesting and innovative writing I have read in quite a while. "Hopefully you can all hear me, or hear yourselves reading my words, inside your heads. I expect this, and further, have a request that you don’t say these words out loud, or even try to explain them to others as this piece is solely to be read aloud in your own minds." I may have disregarded Dave's request at the end of the piece but only with the best of intentions. Tomorrow I am supposed to be a guest on KGNU's climbing radio show, presumably talking a bit about being a superannuated climber and related issues. Look for a guest post at the ClimbingNarc soon on climbing with kids and I also will be writing a piece for FRB on difficulty in climbing called "What's the Problem?" That really was a brilliant post by Graham; Joycean and vaguely Thompson as well. 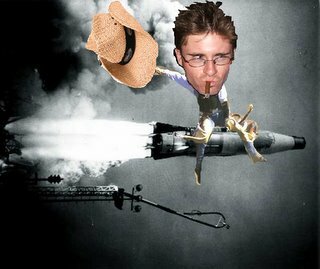 Regardless, way more fun to follow than "And then I did this. It was rad. Then I went there. It was sooo amazing. . ."
fully agree that reading graham's posts is exceedingly interesting... very much like the ebb and flow of thoughts i've experienced when my mind voice was talking to my mind late late late at night in college. i am ignorant of literature, but this is a beat i can groove to for certain. ps: another mention: i also wrote rantings such as this during such late late late mentally burnt nights and mornings at the break of dawn and i can attest that there is a crystaline clarity to dave's maddness.... it's easy to write poorly in this style, but not so much to own it and to be fully invested as he is. he is on the island, to be sure, as if one is just playing with the quill and posing the part, it's as detectable as old tequilla in the water bottle. word. Lohn also speaks of the Island. "Through many epics did we find him, having followed the plumb line mostly, though not owning to our route finding skills, but rather because The Stonemaster had sought us all along. By no other means could you find that island, where the young and strong alight for a month or a year, and jump just as far as they can. Every old Stonemaster knows the place. We still feel the wind on our faces. And in other haunts and in other ways we might still jump beyond ourselves. But only the young can live on those craggy shores, and we would land there no more."